Jaipur's landmark building, the Hawa Mahal or the Wind Palace is a multi layered palace, built by Sawai Pratap Singh (grand son of Sawai Jai Singh and son of Sawai Madhoo Singh) in 1799 AD. The Palace was designed by Mr. Lal Chand Usta, a famous architect of the time. Known for it's beehive like structure, the Hawa Mahal is an interplay of red and pink sand stone, enthusiastically outlined with white borders and motifs. The intricately carved facades of the Hawa Mahal are as ornate as the interiors. The five storeyed facade encrusted with elegant trellis work on windows and small balconies have 953 niches. 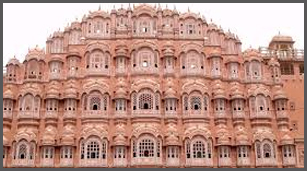 A part of the Jaipur city palace complex, the Hawa Mahal with pierced windows was purposely made to allow the royal women to watch the activities and the ceremonial processions while seated behind the small windows, without themselves being seen. City Palace : This massive structure contains numerous interesting palaces and building of tourist's interest. In the heart of the old city of Jaipur, the City Palace holds a large area, divided into a series of courtyards, gardens, and buildings. Jantar Mantar : The Jantar Mantar is a sophisticated collection of early 18th century structures designed to measure the movements of the stars, sun and planets. Hawa Mahal - JaipurDesigned by Maharaja Sawai Jai Singh himself, each instrument of Jantar Mantar has a specific astronomical task to perform. Amber Fort : The fort, built by the Kachchawaha dynasty at the end of the 16th century is worth visiting. Rail : The train service to Jaipur is available from all the major parts of the country. The direct connections to Jaipur are from Bikaner, Jodhpur, Udaipur, Ahmedabad, Secunderabad, Agra, Lucknow, Mumbai, Chennai and Calcutta. Road : Jaipur is well connected by road to various parts of India. Delhi-Jaipur national highway is one of the finest roads in India. Rajasthan roadways runs excellent regular service of AC and Deluxe Coaches from Delhi.